Schuyler, FORT. On the site of the village of Rome, Oneida co., New York, General Stanwix built a fort which received his name. After the Revolutionary War began it was named Fort Schuyler. In the Revolution it was on the western borders of civilization. There was a small garrison there in the summer of 1777, commanded by Colonel Peter Gansevoort. It stood as a sort of barrier against hostile tribes of the Six Nations. The little garrison had been reinforced by the regiment of Colonel Marinus Willett, and was well provisioned. Burgoyne had sent Colonel St. Leger with Canadians, Tories, and Indians, by way of Lake Ontario, to penetrate the Mohawk Valley and made his way to Albany, there to meet the general. St. Leger appeared before Fort Schuyler on August 3. The Tories in his train were commanded by Colonels Johnson, Claus, and Butler, and the Indians by Brant. 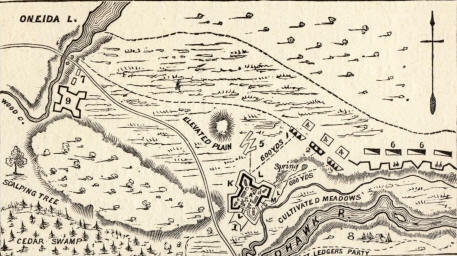 On receiving news that General Herkimer was coming to the aid of the garrison with the Tryon county militia a larger portion within the fort made a sortie. They fell upon the camp of Johnson's "Greens" so suddenly and furiously that they were dispersed in great confusion, Sir John not having time to put on his coat. Papers, clothing, stores, and other spoils of his camp sufficient to fill twenty wagons fell into the hands of the Americans. A part of the "Greens" who had gone to oppose the advance of Herkimer, approaching at that moment, St. Leger continued the siege. Colonel Willett stealthily left the fort at night with a message to Schuyler, then near the mouth of the Mohawk, asking for relief. Schuyler called for a volunteer leader. General Arnold responded, and beat up for recruits. The next day 800 strong men were following Arnold up the Mohawk Valley. At Fort Dayton he pardoned a young Tory prisoner condemned to death, on condition that he should go into the camp of St. Leger's savages with a friendly Oneida Indian, represent the approaching Americans as exceedingly numerous, and so frighten away the Indians. It was done. The Tory had several shots fired through his clothing. Almost breathless, he and the Oneida entered the camp, and told of a terrible fight they had just had with the Americans, who were as numerous as the leaves on the trees. The alarmed Indians immediately fled as fast as their legs could carry them towards the western wilds, followed by the Canadians and Tories pell-mell in a race towards Oswego. So ended the siege, and so did Burgoyne receive a paralyzing blow. While the British retained possession of the Western frontier posts in 1784 it was difficult to fix by treaty the Indian boundaries and open the Western lands to settlers. But a treaty made at Fort Schuyler by commissioners of the United States and the chiefs and warriors of the Six Nations gave some facilities in that direction. By this treaty the Mohawks, Onondagas, Cayugas, and Senecas who had adhered to the British during the war, consented to a peace and a release of prisoners. At the same time they ceded all their territory west of Pennsylvania.